Version of the Young Masters Little Wisdom Curriculum for Montessori applications. Version of the Young Masters Little Wisdom Curriculum for Centers for Spiritual Living applications. Version of the Young Masters Little Wisdom Curriculum for Unity and New Thought applications. The Young Masters Little Wisdom – Discovery Program was designed specifically for children between the ages of 4 and 8. 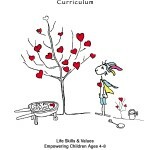 Each lesson and activity of this character education curriculum is based on the Young Masters Little Wisdom books written by award-winning author, Grammy® winner, Bunny Hull, founder of DREAM A WORLD®. Each book introduces a child to a Secret Of The Heart — friendship, imagination, gratitude, courage, creativity and love. Each of these values are explored using stories, songs and an interactive curriculum that will inspire your children as they learn important values, social awareness, life skills and the ability to problem solve and make intelligent choices. For a limited time we are offering you the opportunity to download this curriculum at no cost. We ask only your feedback in return. To download this curriculum simply click on the link below.